For nearly half a century from 1898 to 1945, the Rev. Joshua Alexander Anderson occupied Arborfield Rectory and was a towering influence in village life. In addition to his spiritual leadership, he was chairman of the Arborfield civil parish meetings for many years. The photo on the right was taken in 1898. Joshua was born in Ireland, the son of William Anderson and Elizabeth Paul Adams and grandson of his namesake Rev. 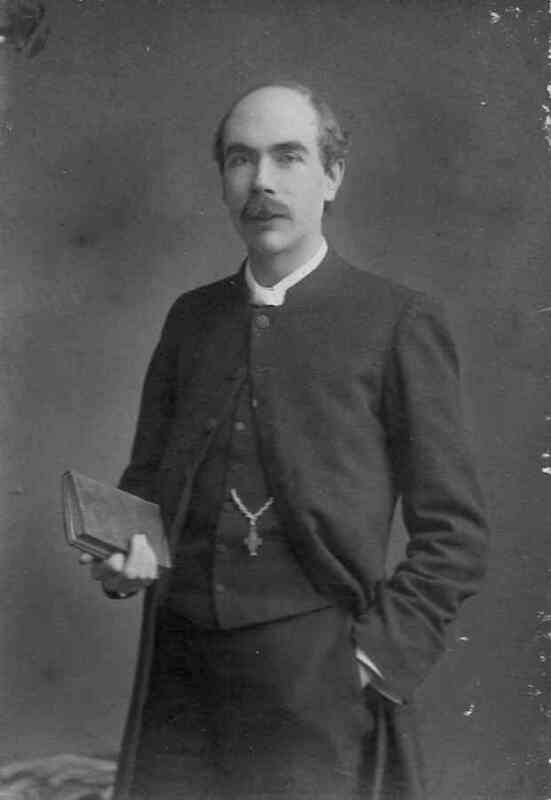 Joshua Anderson, Rector of Myshall at County Carlow. Joshua junior married Edith Constance Hainworth, daughter of Henry Hainworth of Blackheath, in 1896. Some of Martin Shearn's postcards of the old and new churches have the hand-written name 'Hainworth' on them. Edith Anderson died in September 1940, and later during the war, her sisters escaped the bombing and moved to Arborfield Rectory. Another relative, William Hainworth, late of Herne Hill, died at the Rectory on 9th May 1943, aged 78. Canon Anderson took a leading role in the village, particularly during the Great War of 1914-1918. After a short retirement in Boscombe, Canon Anderson died on 5th November 1947. Sir – Canon J. A. Anderson has intimated his intention of retiring after 48 years as Rector of Arborfield, and it is felt that his many friends, both in the parish and elsewhere, would wish to mark their appreciation of his long and fruitful ministry in some tangible way. At a general meeting held in Arborfield on July 27th it was decided to make an appeal both to the present parishioners and to past residents and the many friends the Canon has made both as Rector of the parish and also during his time as Rural Dean. It is desired to give him some personal present which he can take with him to his new home in Boscombe, also to renovate and improve the east end of the church as a lasting memorial of his long ministry. Any contributions should be sent to Mrs. Prescott, of Arborfield Court, who is hon. treasurer of the Appeal Fund, or to either churchwarden. JOHN H. SIMONDS, W. J. VERRALL (Churchwardens of Arborfield). Canon J. A. Anderson, rector of Arborfield for 47 years, leaves the village next week, and will live at Boscombe. At a meeting held at the Village Hall, Canon Anderson was presented with a wireless set by Mr. Stephen Emblen, one of his oldest parishioners. Mr. W. J. Verrall, Mrs. Vickers and Mr. A. Garrett spoke of Canon Anderson’s work in the parish and wished him well on his retirement. Canon Anderson, in reply, referred to the lot of encouragement he had had, not just from the leading residents but from all sections of the community. In his church activities, he has had the support of a loyal band of helpers who had given ungrudgingly of their time and often of their money. When he first came to the village he had only intended to stay a few years, but in fact he almost equalled the tenure of his immediate predecessors, and he never regretted it. Canon Anderson has also been presented with a walking stick by the Sunday School children, and a pair of book-ends by the scholars of the Church Schools. It is understood that the Rev. W. F. Buttle, patron of the living, will officiate at the services in October, until a successor is appointed. At a meeting of parishioners, held at the Village Hall on Monday, Mr. Etchells, the diocesan architect, made certain suggestions for improvements to the church which would form the basis of a memorial to the former rector, Canon J. A. Anderson. On the proposition of Mr. J. H. Simonds, in the chair, the meeting unanimously decided to apply for a Faculty to install a new organ and the choir seats at the west end of the church; to enlarge the vestry; and to carry out other alterations to the chancel and the nave, which would add to the general amenities of the church. Canon Anderson returned to Arborfield for Holy Week and Easter 1946 during the inter-regnum before Claude Sparshott took over in October that year, as noted in the 'Register of Services'. The Register of Services also records his burial at Arborfield on 8th November 1947 as follows: 'Joshua Alexander Anderson, Rector of Arborfield 1898 - 1945; died 5th November. Service conducted by the Bishop of Reading, Canon Winter, Revs. Weller and C D Sparshott (Rector)'.